Modern statecraft is largely a project of internal colonization, often glossed, as it is in imperial rhetoric, as a civilizing mission. This quote from the seminal work of James C. Scott (Seeing Like a State: How Certain Schemes to Improve the Human Condition Have Failed) outlines one of the nemeses of contemporary democracies: lack of transparency. Scott proposes that the central métier of modern statecraft is to make a society legible, to arrange the population in ways that simplified the classic state functions of taxation, conscription, and the prevention of rebellion (1998). All efforts—from application of novel systems which name and classify places, roads, people, property and now the collection of citizens’ private data—are mechanisms by which the state renders its people and landscapes legible to political ends. While the public is becoming more and more legible and exposed to governments, the inner workings of the state, how policies are formulated and decisions made, often remain, whether intentionally or not, largely complex and opaque to the public. In this essay we reflect on our learning around current policy making and citizen engagement approaches in London and Mexico City for the Legible Policies project. We then explore possibilities for using some of our successful design methods and experiments to help in creating a more equal footing between those in power and those who are meant to trust that power. While policy making strategies in London and Mexico City are very different, and in both cases difficult to penetrate, we observed systemic rifts common to both. One of the key pain points for civil servants internally, as suggested by policy makers we spoke to, and outlined clearly in the Institute of Government’s Report (Hallsworth et al., 2011) is the gap between theory and practice in policy making. The lack of capacity and opportunity to adapt policies to local or changing circumstances means that in practice, policy making processes remain difficult to explain, even for those who make them. The report points to an urgent need to introduce more iterative design-led approaches to policymaking that can take into account rapid social, economic and technological change, increased citizen engagement and political unrest. We also observed discontent in the tokenism around ‘active’ citizen participation in governance processes. Sherry R. Arnstein in her important paper Ladder of Citizen Participation (1969) labelled this practice as ‘placation’—the co-option of hand-picked ‘worthy 108 citizens’ onto committees, allowing them to advise or plan ad infinitum but retaining the right to judge the legitimacy or feasibility of the advice to the power holders. The London Plan (2015), a long-term strategy for the city of London, which is legally drafted and finally versioned by the Mayor is a recent and ongoing example of placation. Consultation sessions with local councils and citizen unions are held in order to receive feedback. But, there is no obligation for the Mayor’s Office to take suggestions from these sessions into account. For instance, an 80% affordable housing (London Plan, pol. 3.10, 2015) prices threshold had been introduced in a draft for the currently approved London Plan. The decision was turned down by several local boroughs, based on an independent planning inspector’s report which stated that local authorities should be able to determine their own local affordable rent levels to meet local housing needs. The Mayor allegedly ignored the report and included the policy in the final version of London Plan. This resulted in a legal action (Freeman, 2014) by nine councils against the Mayor’s office. Another systemic error is the misalignment between the policy’s long term benefits to the city and its citizens, and citizens’ aspirations in the short term. Often this is because there are no sustained dialogues to discuss the visions behind such a policy. For instance, in Mexico City, the introduction of parking meters brought in much criticism. The government’s intent was to reduce car usage, eliminate the shadow economy of nontaxable local franeleros as well as collect money for local infrastructural improvements. Unfortunately, citizens did not see the benefits of such strategy, (Morse, 2015). Shop owners in the city centre were worried that the presence of parking meters outside their shops would reduce clientele. Regular commuters were afraid of losing their habitual parking spaces, previously secured by befriended franeleros. Further confusion ensued because of the lack of transparency around actual spending on the implementation of the policy. While the authorities claim that as much as 30% of the collected funds were invested in local area infrastructures, data shows that in 2015 only about 11% of public spendings have been accounted for, and the Supreme Court has ruled out a necessary audit (Morse, 2015). What becomes obvious in these examples is that whilst policy making has good intent, in reality citizens often feel alienated from the process and lack the appropriate knowledge and tools that would create mutual trust and affect change. Here, we use ‘legible’ as a term that is more than just making invisible or complex policy layers legible. Instead, legibility would mean the creation of a shared understanding of governance and political processes, for all stakeholders, above all citizens. It should make it easier to understand what influence and agency citizens have within the system, what tools and capacities can help act on that agency, and how citizen input becomes actionable through sustained dialogue and transparent feedback loops. If this is one of the key ambitions of the Legible Policies project, then first of all, we need to acknowledge how complex and misunderstood the term ‘citizen’ is in contemporary democracies, in order to better understand the changing notions of citizenship. In contemporary terms, citizens are members of a political community: They can exercise their rights and power to participate in the affairs of the city, voice opinions while withholding their unique multiple identities and can, most importantly, influence change (Jones, Gaventa, 2002). If we go right back to the notion of Polis, the involvement in the affairs of the city defines the modern day citizen’s identity to a large extent (Polis n.d. In Wikipedia, 2016). We know today how elitist and difficult that ambitious vision of citizenship is. These changing definitions of citizen and citizenship are often at odds with the everyday lived realities of people. Does the term citizen mean anything more than paying taxes, voting (occasionally, with discontent), and the fragmented opportunities to express their opinions through various media? Do most people care enough to actually volunteer their time to better understand, and when possible participate in the workings of the state? As we began our research, we traced a particular trajectory of active citizen engagement in both cities. It leads us to believe that there is desire and intent, within large groups of people, to affect change. Mexico City’s history of authoritarianism has created a deeply engraved culture of regular protest as a means by which citizens question the decisions and actions of the government. Between 2013-2014, there have been 2302 registered manifestations in Mexico City, averaging 6.3 a day. (Ortuño, 2015). From the Suffragettes to the CND marches in the 1980s to the recent anti-war and student protests, London’s history too, is replete with instances of relentless citizen demands for voice and power. (List of Riots in London. In Wikipedia. 2015). Today, we see a steady rise in the number of citizen-led organisations advocating for people’s input in policy making processes. For instance, London’s Just Space, has organised its own working groups with local citizens, and together they intend to propose an alternate London Plan. The plan will be introduced directly to the new Mayor, on his first day of service, right after the upcoming elections (Just Space, 2016). Some earlier adjustments (Just Space, 2012), proposed by Just Space and their partners to the currently approved London Plan, have also been taken into consideration by the Mayor. The Open Government (2015) is an international initiative with numerous governmental, NGO and citizen-led organisations who come together to propose an alternate National Action Plan based on broad and participative engagement with civil society. The International Association for Public Participation (2016) offers worldwide 111 consulting on citizen engagement benefits for governments, civil society organisations, and industry. From within the government too, several programs have been created to encourage transparency. Policy Lab’s Open Policy Making (2014) initiative has published a toolkit (2016) and techniques policy makers can use to create more open and user led policy. Other similar initiatives are the Smart London Community Engagement (2016) proposal and Mexico City’s Presupuesto Participativo (2015), a promising drive to introduce new policies to citizens. The Mapaton CDMX project is a great example of how citizen participation can generate data that would otherwise be impossible to gather, thus closing the loop between data generation and data consumption. These initiatives have created awareness and raised questions about accountability and transparency. But there is an urgent need for many more creative, bottom-up and inclusive methods for a shared pathos for multiple actors. We would like to draw on our own research and design practice to suggest an exploratory set of experiments that are more profoundly grounded in actual practice, so that all stakeholders may gain greater trust in generating and implementing policies. Our design and research practice focuses on generating alternate visions of the future by bringing in the voice of multiple stakeholders and communities. Examples of such methodology from our work include projects like Power of 8 (Superflux, 2009), Lilorann (2010), Synbio Tarot Cards (2012), Mangala for All (2015), Port Fiction (2015) and Failed States (2014). Increasingly we find that this design-led approach of creating experiential, inclusive, plural futures is proving valuable for governments and public sector organisations. For instance, we are currently working with City of Eindhoven (Smart Council, 2016) to design strategies for participatory smart cities, as well as the Policy Lab in the Cabinet Office (2014), to use speculative design to create more inclusive policies for the future of rail transport. Based on this experience, we propose five experiments in the policy making process that could work alongside current methods. Political ethnography is not a new method, but we would like to enhance it with specific design tools to aid insight gathering and dissemination. In our experiment, political ethnography becomes a means by which unbiased third party actors study the direct inner workings of state actors and political institutions, as well as the ‘grey zones’ of clandestine political activity (Auyero, 2007). Such activity, encouraged by academic and research institutions, could provide a deeper understanding of policy making processes, the evidence and intent behind decision-making, and potential implications of those decisions. Where possible, audio and video recordings of various civil servants and policy makers could become powerful emotive mechanisms by which citizens understand the aspirations and even the vulnerability of those in whom they trust. Most importantly, such activity would display a willingness for political actors to become participants in making their own work legible, rather than asking citizens to actively participate in governance processes. For instance, Laboratorio para la Ciudad continually document their urban experiments and make them publicly accessible (2016). Object-driven design research is a successful experiential method we have used for our ethnographic work in which diegetics and prototypes are used to provoke responses. Alongside observations and interviews, by looking and even touching actual props, participants are encouraged to imagine new possibilities. These often speculative prototypes help ask ‘what if’ and ‘as if’ questions, giving people the space to develop opinions, get involved and commit to the conceit. Within the context of political ethnography, creating tactile props such as visual diagrams of alternate policy process, or new versions of existing policies, could act as valuable provocations. It will be critical to ensure that the insights from the political ethnography work are widely accessible. One possibility to achieve this is to redesign the traditional tools of political campaigning as it is a familiar and accessible format. For instance, a tactical dissemination toolkit could include templates for flyers, posters, stickers and notices which could be filled in with key findings and placed on public noticeboards, cafes, libraries, town halls and pubs. We imagine local councils, citizen-led initiatives, and numerous non-governmental organisations would be keen to try such low-cost tools and become early adopters. Several of the ideas that emerged during our workshop in Mexico City explore such dissemination tactics. Prices in Public, for example, are stickers on public infrastructure which enumerate their costs and funding sources, Parking Meter Monthly Updates would show how much money was collected and how much (and where) it was spent. Also, Money Off, is a prop highlighting that government is providing bikes, parking and much more at highly subsidised rates. Apart from visible stickering, cheap and accessible digital tools could also be designed to help people understand the multiple hidden layers of the city and its infrastructure. Several artists and designers have successfully explored such analogue tactics. Candy Chang’s project I Wish This Was (2012, see fig. 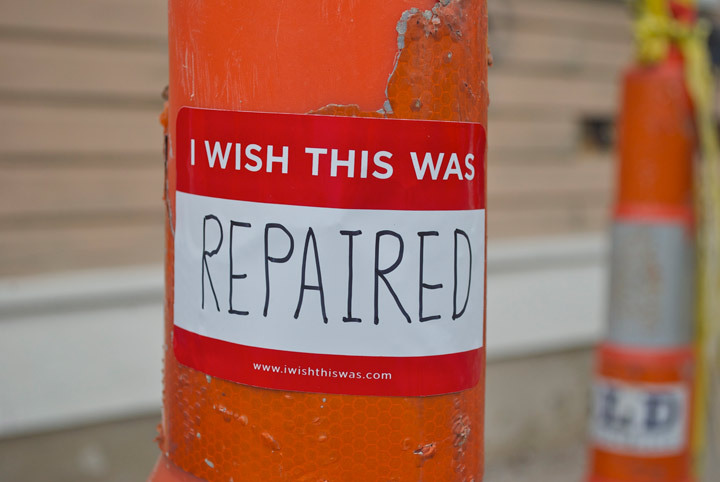 9), used a very simple stickering tool, which said I Wish This Was—on vacant buildings across New Orleans to invite residents to easily share their hopes for these spaces. Anab Jain’s project Yellow Chair Stories (2005, see fig. 10, 11) became a shared community space for neighbours to meet and debate local issues in exchange for a free WiFi connection. Fig. 12. Candy Chang. I Wish This Was (2012). Another highly successful and effective way of raising awareness and visibility about opaque political procedures dissemination tactic is performance, either in the street or theatre. The prolific Dutch actors’ group Wunderbaum (Redcat, 2012) creates exceptional, performative presentations that confront audiences with the realities of politics and citizenship. One of the biggest rifts in the current system is the lack of shared future visions between the state and its citizens. When a policy needs to be implemented in London, there is a consultation process through which people can comment and respond (London Elects, 2015). However, such public feedback often comes too late in the policy-making process. Subsequently, implementation of a new policy comes as an unpleasant surprise to people who have no mechanisms to reverse it. As we saw with the parking meters in Mexico City, there is a notable disparity around the notions of greater good, dividing the visions of policymakers and the public. We strongly believe that there is a clear need for safe spaces, both physical and conceptual, where future policies can be openly extrapolated and their implications considered. An environment is needed where alternate future visions and aspirations of citizens could be expressed without the constraints of existing socio-political, economic and legal conditions that can bind them to present day lived realities. When people envision such futures it becomes easier to also envision and understand their consequences. Furthermore, they feel encouraged to create and share their aspirations, as well as their doubts around particular policies. One immediate opportunity to conduct small speculative experiments could be around Mexico City’s Ecobike scheme (CDMX, 2010 currently used by specific segments of primarily young people. During our field visit we observed numerous ways in which people currently transport small numbers of good (walking and pushing small trolleys, walking with objects on their heads etc). Are there opportunities to speculate jugaad-like hacks such as modular add-on or foldable attachments around the ecobikes that might be useful for these groups? An inclusive and iterative speculative design process could yield surprising results, and in turn make the designed system more culture and context sensitive. The current London Plan proposes big improvements to the cycling infrastructure. (London Plan, pol. 6.9, 2015) Another long-term strategy that figures in that same plan, however, is to increase the number of parking lots around the city (London Plan, pol. 6.13, 2015). The two policies, part of the same long-term plan, clearly contradict each other. Parking lots, notably in residential developments, are in some cases projected to be increased up to 100%. Sustrans, a charity for sustainable mobility, stresses that there is high risk of encouraging the use of two or more cars with consequent impacts on local congestion and pollution, while discouraging cycling and walking (Sustrans, 2015). Here, speculative design approaches could become useful mechanisms in exploring future mobility scenarios by involving different stakeholders. Citizens who commute to central areas for working purposes, as well as families who use cars for longer-distance weekend trips, along with mobility experts, ethnographers and designers, could be invited to participate. Such an experiment is not meant to replace official Consultation processes, but instead be used alongside these proces, or perhaps work some of the methods we describe into the consultation processes. Recently, the Inclusive City Roadmap (Kaufman, 2016) by City of Cambridge has adopted an exemplary creative, interactive process to engage citizens in collaborating on urban planning projects. Ultimately, this experiment becomes a generative space of future dreams and conflicts where citizens and those in power can meet on an equal footing. How do Working Groups process the rich qualitative data gathered in the futuring process and experiments? Thoughtfully designed filtering and visualising methods can work effectively alongside traditional sense-making techniques to help policy makers pick weak signals from the noise and work towards a sensitive, ethical strategy for decision making. The experiment here would be to design a series of frameworks and filters that emerge after the futures visioning exercise rather than predetermined, generalised filtering. For instance, a game-changing technological breakthrough in emission efficiency or the failure to reach a major global political agreement for sustainable development can both be used as context-sensitive filters for discussions in terms of specific policies. This can become a robust tool for addressing the messy ground-level realities of policy making. Furthermore, specific filtering would encourage decision makers not to resort to comforting narratives that impose specious order on a complex reality, but feel confident in adopting emergent design practices for iterative policy making. One of the most important aspects of making policies legible is to ensure that new governance models in democracy move past tokenism. When citizens who choose to volunteer their time achieve a sense of agency and ownership toward the activity, it is imperative that they be kept abreast of the translation of that activity into a policy, and know how their involvement aids in the final decision-making processes. Simple tools of design and media can help make the translation, decision making and communication processes more open, and ensure that contributors retain their sense of ownership and agency. Debates can be tweeted, videos streamed, where possible, with the possibility for people to respond in real time. Even if people don’t watch, the fact that it is being streamed can give them the sense that the intention is transparency rather than closed doors. Some practices (parliamentlive.tv) already include live streams from parliamentary sessions and interactive means for citizens to simulate voting on legislations. Through the experiments we have outlined we wanted to sketch out new opportunities for addressing some of the systemic rifts in policy making by giving all actors who have a stake in shaping our cities a voice and safe spaces for creative dreaming. In order to understand the direct value of these experiments, we would need to conduct ground level, small scale trials. If designed sensitively, ethically and with respect for individual privacy, such safes spaces can support and encourage shared ownership of ideas and in turn, a bigger stake in governance processes. Any such experimental or out-of-the-textbook repertoire of tools will need immense political will, conviction and suspension of disbelief. To acknowledge the need for any such alternatives would mean acknowledging the need for a world where power is more evenly distributed between the state, non-state actors and citizens. Arnstein, S. R. (1969). A Ladder of Citizen Participation. In: Journal of American Institute Planners, Vol. 35, No. 4. [online] Available at: http://lithgowschmidt.dk/sherry-arnstein/ladder-of-citizen-participation.html [Accessed March 10, 2016]. Auyero, J. (2007). Routine Politics and Violence in Argentina: The Gray Zone of State Power (Cambridge Studies in Contentious Politics). [print] Cambridge: Cambridge University Press, 1 ed. Chang, C. (2012). I Wish This Was. [online]. Available at: http://candychang.com/work/i-wish-this-was/ [Accessed March 21. 2016]. Freeman, J. (2014). Councils Join Forces for Legal Challenge Against Mayor’s Plan to Relax ‘Affordable Rents’ Rules. [online] London: Evening Standard. Available at: http://www.standard.co.uk/news/london/councils-join-forces-for-legal-challenge-against-mayors-plan-to-relax-affordable-rents-rules-9188995.html [Accessed March 21, 2016]. Hallsworth, M., Parker, S., Rutter, J. (2011). Policy Making in the Real World. Evidence and Analysis. [pdf] London: Institute for the Government. Available at: http://www.instituteforgovernment.org.uk/sites/default/files/publications/Policy%20making%20in%20the%20real%20world.pdf [Accessed March 21, 2016]. International Association for Public Participation. (2016). [online] Available at: http://www.iap2.org/ [Accessed March 13, 2016]. Jain, A. (2005). Yellow Chair Stories. [online] Available at: http://superflux.in/work/yellowchair-stories [Accessed March 23, 2016]. Jones, E., Gaventa, J. (2002). Concepts of Citizenship: A Review. [pdf] Brighton: Institute of Development Studies. Available at: https://www.ids.ac.uk/files/dmfile/Db19.pdf [Accessed March 21, 2016]. Just Space. (2012). [online] London: Just Space. Available at: https://justspace2010.wordpress.com/ [Accessed March 14, 2016]. Just Space. (2016). Towards a Community Led Plan for London: Ideas for discussion and debate. [pdf] London: Just Space. Available at: https://justspacelondon.files.wordpress.com/2016/01/towardse280a6final.pdf [Accessed March 11, 2016]. Kaufman, R. (2016). Cambridge is Working on an Inclusive City Road Map. [online] Philadelphia: Next City. Available at: https://nextcity.org/daily/entry/cambridge-inclusive-planning-new-city-master-plan [Accessed March 22, 2016]. London Plan. (2015). Policy 3.10: Definition of Affordable Housing. [online] London: gov.uk. Available at: https://www.london.gov.uk/what-we-do/planning/london-plan/current-london-plan/london-plan-chapter-3/policy-310-definition [Accessed March 15, 2016]. London Plan. (2015). Policy 6.9: Cycling. [online] London: gov.uk. Available at: https://www.london.gov.uk/what-we-do/planning/london-plan/current-london-plan/london-plan-chapter-6/policy-69-cycling-0 [Accessed March 16, 2016]. London Plan. (2015). Policy 6.13: Parking. [online] London: gov.uk. Available at: https://www.london.gov.uk/what-we-do/planning/london-plan/current-london-plan/london-plan-chapter-6/policy-613-parking-0 [Accessed March 16, 2016]. MapatonCDMX. (2016). [online] Available at: http://www.mapatoncd.mx/ [Accessed March 24, 2016]. Morse, J. (2015). Why Residents of Mexico City Are Organizing Themselves Against Parking Meters. [online] New York (NY): Vice News. Available at: https://news.vice.com/article/why-residents-of-mexico-city-are-organizing-themselves-against-parking-meters [Accessed March 15, 2016]. Open Government. (2015). [online] London: gov.uk. Available at: http://www.opengovernment.org.uk/ [Accessed March 22, 2016]. Ortuño, G. (2015). El Sabueso: AMLO asegura que en su gobierno no hubo manifestaciones ¿Será? [online] Mexico City: Animal Politico. Available at: http://www.animalpolitico.com/elsabueso/el-sabueso-amlo-asegura-queen-su-gobierno-no-hubo-manifestaciones-sera/ [Accessed March 15, 2016]. Policy Lab. (2014). Welcome to the Policy Lab. Open Policy Making. [blog] London: gov.uk. Available at: https://openpolicy.blog.gov.uk/2014/06/30/welcometo-the-policy-lab/ [Accessed March 21, 2016]. Policy Lab. (2016). Open Policy Making Toolkit. [online] London: gov.uk. Available at: https://www.gov.uk/guidance/open-policy-making-toolkit [Accessed March 21, 2016]. Presupuesto Participativo. (2015). [online] Mexico City: IEDF. Available at: http://www.iedf.org.mx/index.php/index.php?option=com_content&view=article&id=2954 [Accessed March 12, 2016]. Redcat (2012). Wunderbaum: Songs at the End of the World. [online] Los Angeles (LA): Redcat. Available at: http://www.redcat.org/event/wunderbaum-0 [Accessed March 21, 2016]. Scott, J. (1998). Seeing Like a State. [print] New Haven and London: Yale University Press. Smart London Community Engagement. (2015). [online] London: gov.uk. Available at: https://www.london.gov.uk/decisions/add376-smart-london-community-engagement [Accessed March 10, 2016]. Superflux. (2009). Domestic Gubbins. [online] Available at: http://www.superflux.in/work/domestic-gubbins [Accessed March 23, 2016]. Superflux. (2009). Power of 8. [online] Available at: http://superflux.in/work/power-8 [Accessed March 23, 2016]. Superflux. (2012). Synbio Tarrot Cards. [online] Available at: http://superflux.in/work/tarotcards [Accessed March 23, 2016]. Superflux. (2014). Failed States. [online] Available at: http://www.superflux.in/blog/failed-states [Accessed March 23, 2016]. Superflux. (2015). Mangala for All. [online] Available at: http://www.superflux.in/work/mangala-for-all [Accessed March 23 2016]. Superflux. (2015). Jon Ardern: Highlights from the Studio: Port Fiction. [blog] Available at: http://superflux.in/blog/news-highlights-from-the-studio [Accessed March 23, 2016]. Sustrans. (2015). Minor Alterations to the London Plan: Parking Standards. [pdf] London: Sustrans. Available at: http://www.sustrans.org.uk/sites/default/files/images/files/0615_Minno_alterations_Parkin_Standards_Sustrans_response.pdf [Accessed March 14, 2016]. Smart Council. (2016). [online] Eindhoven: The State of Eindhoven. Available at http://destaatvaneindhoven.hetnieuweinstituut.nl/en/smart-council [Accessed March 23 2016]. Wikipedia. (2015). List of Riots in London. Available at: https://en.wikipedia.org/wiki/List_of_riots_in_London [Accessed March 12, 2016]. Wikipedia. (2016). Polis n.d. Available at: https://en.wikipedia.org/wiki/Polis [Accessed March 22, 2016]. Figure 1. Partlow, J / The Washington Post. Residents in Coyoacan march down the streets protesting the city government’s plan to install parking meters in their neighborhood (2014) [photo] Available at: https://img.washingtonpost.com/rw/2010-2019/WashingtonPost/2014/03/19/Others/Images/2014-03-19/IMG_39051395252253.jpg?uuid=410UCK-QEeO4s0Sx0c1MHw [Accessed March 23, 2016]. Figure 2. Reuters. A local taxi driver paints ‘Uber Out’ on the back windshield of his car during a protest in Mexico City on May 25 (2015). [photo] Available at: https://img.washingtonpost.com/rw/2010-2019/WashingtonPost/2015/06/08/Foreign/Images/2015-05-25T194800Z_01_TBR12_RTRIDSP_3_MEXICO-UBER.jpg?uuid=0cf13g1_EeWg3CtvQE_1zw [Accessed March 23, 2016]. Figure 3. Kemp. M. / In Pictures / Corbis. 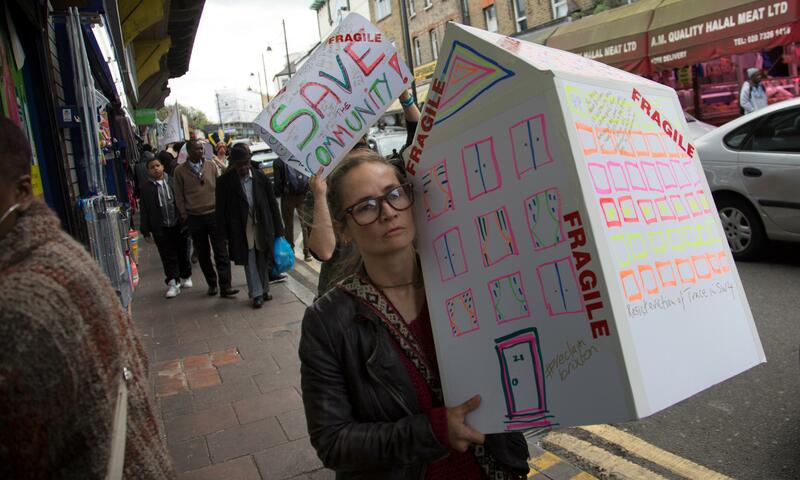 Activists and residents gathered for a Reclaim Brixton protest in April against gentrification (2015). [photo] Available at: https://media.guim.co.uk/f9b95037503bbaea8e10658ce71a59c13a22216d/0_130_5126_3076/5126.jpg [Accessed March 23, 2016]. Figures 4, 5, 6. MapatonCDMX. [photo] Available at: https://www.flickr.com/photos/106608754@N04/sets/72157652212070581 [Accessed March 24, 2016]. Figures 7, 8. Superflux. Mangala for All (2015). [photo] Personal archive. Figure 12. Chang, C. I Wish This Was (2012). [photo] Available at: http://1.bp.blogspot.com/_nAWhnWKWr-w/TRtdHgBhhRI/AAAAAAAAA6E/glABJoJRGmw/s1600/i-wish-this-was-repaired.jpg [Accessed March 23, 2016]. Figure 13. Jain, A. Yellow Chair Stories (2005). [photo] Personal archive. Figure 14. Wunderbaum. Songs at the End of the World (2012). [photo] Personal archive. Figure 15. Superflux. Drone Aviary: Traffic Drone (2015). [photo] Personal archive. Figures 16. Superflux. Power of 8 (2009). [photo] Personal archive. Figures 19, 20. Interboro Partners. Cambridge Mobile Engagement Station (2016). [photo] Available at: https://nextcity.org/daily/entry/cambridge-inclusive-planningnew-city-master-plan [Accessed March 23 2016].